LinkedIn Makes Spamming Contacts Easy With Conversation Starters... Fun! 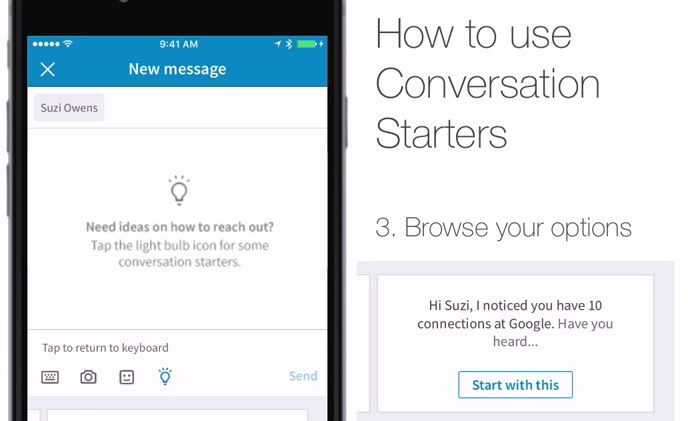 “With conversation starters, you can spend less time figuring out what to say, and more time having conversations that help you get ahead and reach your professional goals,” says Sammy Shreibati, LinkedIn Product Manager. Sheesh… give me a break! Helpful. No. Spammy. Yes. Seriously, this is not an authentic way for salespeople to contact prospects, especially because it is built-in to LinkedIn messaging where decision makers can be guaranteed to receive multiple versions of these in their in-box. All sales messages should be authentic, personalized to the prospect and provide some specific solution the marketer knows that the receiver of the message will relate to. Here are some prospecting tips.